From non gmo foods to 100% certified organic bath and body care products, it is of the utmost importance to me she gets – only the best! MADE OFTM, is an organic baby product company that carries everything from baby wipes to hand soap and body lotion. What makes this company stand out from the rest is their promise for transparency. Not only are they the first and only company to disclose every ingredient, but they also share its origin, location of factories, and if available, Organic certificate and testing documentation. They are the first, and only brand, to be all NSF Organic certified across everything* they make (*excluding diapers)!! The wipes are wonderful! They have a light and clean scent! 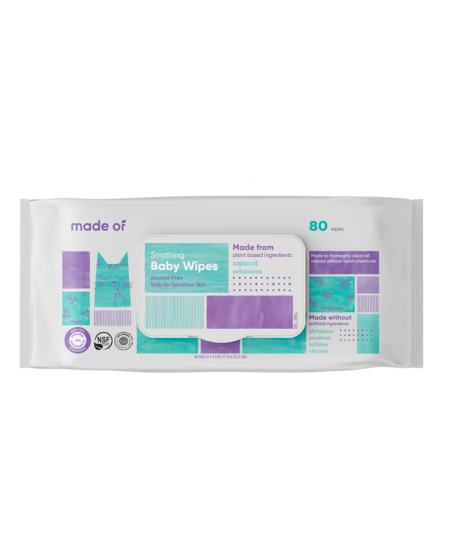 Perfect for babycare on-the-go, these wipes are both alcohol and chemical free! Containing nourishing oils and organic plant based ingredients, they effectively get the job done without striping the delicate skin. This is a big one for us! Living in a beach town, we are never short of sunshine! With that lovely warm sun comes harmful UV rays! Luckily for us, MADE OFTM has a safe and effective sunscreen that works without containing anything harmful. I found this lotion to be pretty amazing. I’ve become quite the germaphobe since I’ve become a mother. Constant hand washing is great for keeping the germs at bay, but it can do a number on your skin – drying it out. No mother wants to caress and tickle her little bundle of joy with reptile hands! This lotion delivers soft and smooth results. 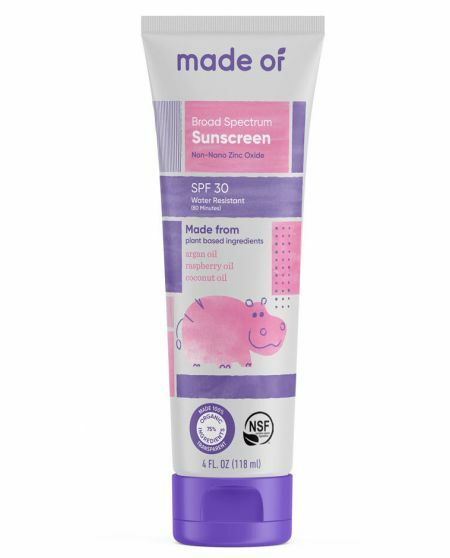 If you baby suffers from baby eczema, this lotion is a great moisturizer that will help your baby’s skin retain its natural moisture. Apply immediately after a bath, moisturizing your baby’s skin to prevent flare-ups is crucial. Hand soap is a mother’s best friend! 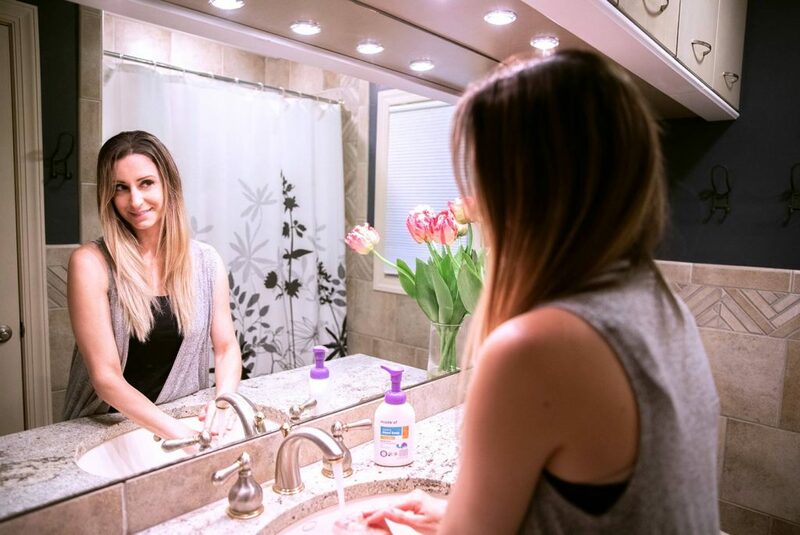 Between wiping runny noses, picking food off the floor or dealing those awesome blow outs (note the sarcasm), there is no shortage of grossness – when you’re a mom. I should have a holster around my waist for as many times as I need hand soap, it’s constant! 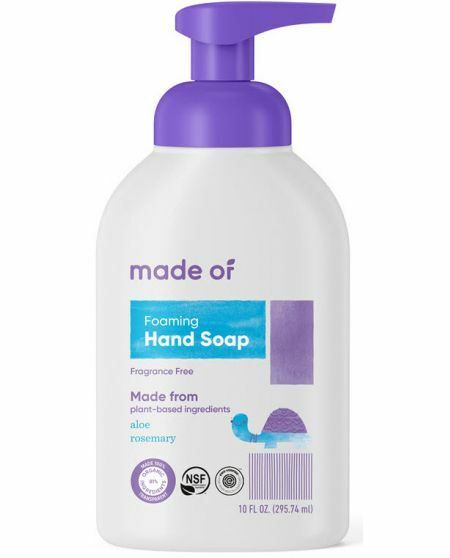 MADE OFTM makes a foaming hand soap that works without containing the harmful chemicals so many hand soaps have! I’ve tried my fair share of bath and body products on my daughter, some are better than others. 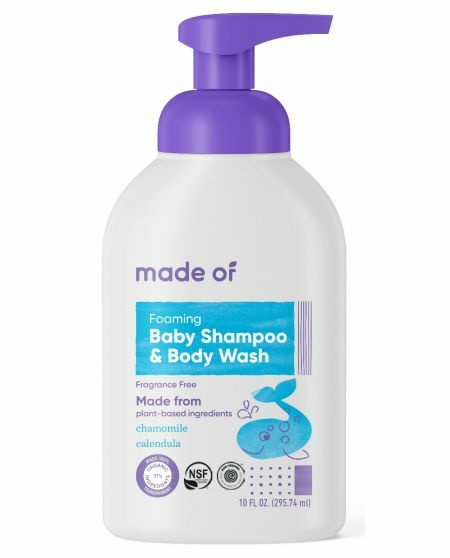 MADE OFTM baby shampoo and body wash is certainly a front runner! With a mild and pleasant scent, this soap suds on and rinses off easily, making my sweet baby cakes squeaky clean! Note: We did notice some irritation when it got in my daughters eyes. MADE OF uses Organic and natural ingredients derived from plants. They make everything you need for safe, healthy, stress-free babies, family and the home! MADE WITHOUT: GMOs, SLS, Phthalates, Parabens, Sulfates, synthetic fragrances, dyes, pesticides, BPA, chlorine and much more. Although, we did not personally try this product, I wanted to let you guys know they do have it! When my daughter was younger we really had a problem with diaper rash. I’m so happy to see a company that offers an organic diaper rash cream solution to your baby’s bottom. A soothing blend of organic oils, like avocado and argan, combined with non-nano zinc oxide provides a barrier of protection against wetness causing irritation. Get monthly supply of diapers and wipes and save over $600 annually, with a Basic Diapers and Wipes Subscription for as low as $80 a month! 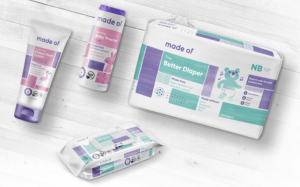 MADE OF diaper is ULTRA absorbent with up to 10-hours of leak free guarantee. I have to say, MADE OFTM delivers! Being a mom is the hardest job ever. I’m thankful MADE OFTM helps my job a little easier, by providing safe and organic tools to get the job done. 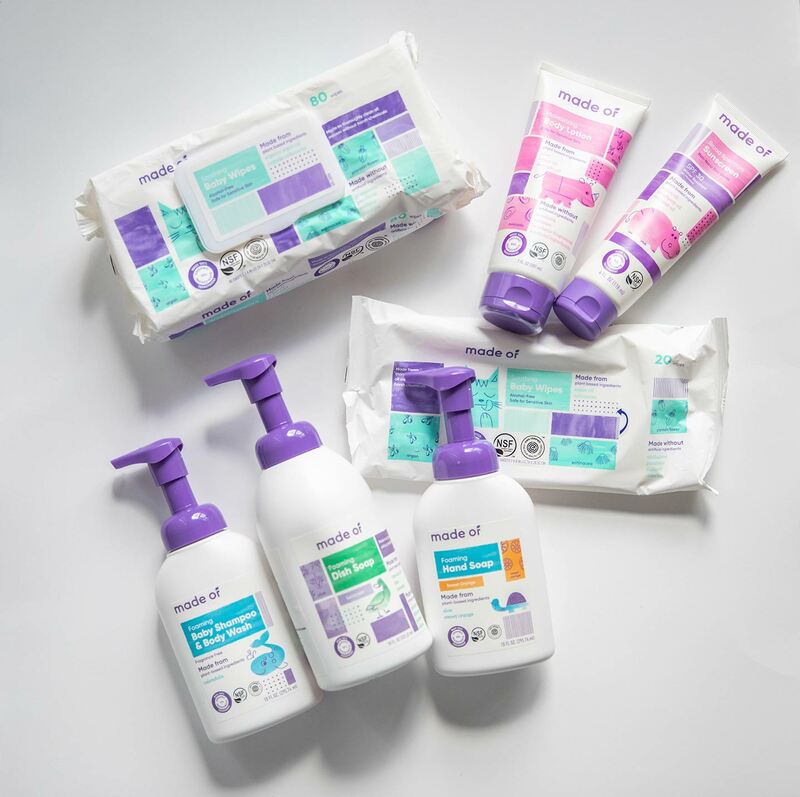 I can breathe a sigh of relief knowing I’m using safe products on my little one, that’s one less thing I have to worry about! Have you tried MADE OFTM? Disclaimer: I was provided products in exchange for an honest review on my blog. All photos are copyright to MommaReview.com. All views in this review are 100% my own. This page may contain affiliate links.